The Department of Musicology pursues research and instruction in musicology – the study of music. The musicology program seeks to develop highly-trained individuals who go on to pursue musical research or related work. The department was established in 1949, when the Tokyo Ongaku Gakko (Tokyo Music School, founded in 1887) became the Faculty of Music of Tokyo Geijutsu Daigaku. However, the Ongaku Torishirabegakari (Music Investigation Committee, 1879 – 1887), predecessor of Tokyo Ongaku Gakko, was dedicated to both the instruction of practical performance techniques and the research of various types of music, including topics in the history and theory of Japanese and Western music. 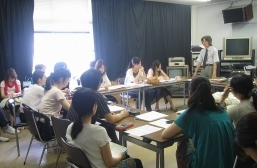 The curriculum of the Tokyo Music School also included courses on music history, music theory, and aesthetics. This shows that those subjects were already recognized as essential parts of a specialized musical education. Gakuri, the Japanese name for the department, has a lengthy history in Buddhist chants, and was apparently adopted because at the time the term ongakugaku (“musicology”) was unfamiliar to the general public. When it was first founded, the department focused on the history and theory of Western music. Over the years, it has broadened its scope to encompass the history of Japanese and Asian musics and ethnomusicology, resulting in its current educational and research structure that incorporates a broad perspective, responsible for a wide range of musical issues. Current classes in the Department of Musicology cover a wide range of musical topics, taught in the form of lectures and individual work in specialized music subjects, with an additional focus on learning foreign languages. In addition, practical music techniques and music theory are required subjects, and students are expected to pursue research closely related to musical practice, a particular strength of the university. Graduate education in the Department of Musicology (master’s and doctoral courses) occurs within the Musicology and Music Studies Department. 1. Subjects that aim to broaden the insights and perspectives not only related to music but also the fine arts, culture, and society (Liberal arts subjects, Fundamental subjects of major field of study). 2．Subjects that aim to nurture a broad understanding of the research trends in various fields of the study of musicology (“Introduction to the Study of Music,” “Series of Lectures on the Study of Music”). 3. Subjects that aim to foster the acquisition of research methodologies and presentation skills for the study of music (“Beginner Level Practicums,” “Practicums for Each Type of Music”). 4. Training and practical techniques in music for research purposes (“Solfege,” “Practical Techniques In the Sub-major,” “Practical Techniques and Subjects In Musicology,” “Harmonics”). 5. Subjects for the acquisition of foreign languages, and their utilization for research purposes (Various foreign language subjects, “Reading in Music”). 6. Subjects that enable students to integrate the abovementioned skills and formulate their problem awareness into a single study. (“Training in the Study of Music,” “Graduation Thesis”). 1 ． In the Master’s Program, the aim is to nurture professionals with advanced insights and research methodologies related to the study of musicology. In keeping with this goal, the program includes two courses offered by all studios, “Seminar in Musicology” and “Special Studies in Musicology” (required). Within a stipulated range, students can also attend classes by other studios and departments, special lectures on original musical compositions, and classes offered by the Faculty. 2. The doctoral program nurtures research abilities that are required for professional researchers of musicology to conduct research independently. To achieve this, a collective guidance system is adopted. Students make successive presentations of research results based on the annual plans, while several faculty members examine the relevance of the plans and evaluate the results. Apart from The Collection of Theses on Musicology and Music Studies, the results are presented in the “General Seminars in Musicology” and the “Doctoral Colloquium,” and students are required to make oral presentations. Furthermore, publications in academic journals and presentations in academic conferences are also included in the evaluation. 1. The ability to think critically and logically based on broad insights and perspectives related not only to music but also to fine arts, culture, and society. 2. The ability to understand music from multifaceted perspectives, and integrating knowledge-based and theoretical approaches to music, including practical experience in music. 3. The ability to explore their awareness of issues apart from acquiring musicological research methods, to analyze the events, and find a solution to the problem, including presentation of the results. Furthermore, students who have acquired the stipulated credits by the end of the second year and have demonstrated outstanding achievements may have the option of graduating from the Faculty in three years. 1. Master’s Program: The Master’s degree is awarded once the stipulated credits have been acquired, the necessary guidance has been received, the Master’s thesis has been written and submitted, and the student has passed the thesis review. Students are required to make a mid-term presentation during which they submit their thesis. The thesis review is conducted by the full-time faculty members belonging to the concerned field of study in the Department of Musicology. Aspects that are rigorously reviewed include accurate knowledge on the research field as a whole, accurate understanding of the research trends, sound research methodology, logical consistency, complete written expression, and academic originality of the research. 2. Doctoral Program: The doctoral degree is awarded once the stipulated credits have been acquired, the required research guidance has been received, the doctoral dissertation has been written and submitted, and the student has passed the dissertation review. The Thesis Review Committee comprises the chief examiner and several vice-examiners (depending on the content, this may include appointments of specialists from outside the department or university), and the review is conducted publicly. Students are evaluated on whether they can sufficiently conduct independent research as specialists of musicology, have advanced expert knowledge and the ability to develop it, and the originality to make contributions to the academic community. The Department of Musicology seeks to train versatile students who have insight into humankind and the world through music and who can present their thoughts to society. Therefore, undergraduate education focuses on giving students broader perspectives and knowledge related to music and musicology, acquiring musicological research methods, and developing an awareness of issues into a single research theme. At the same time, each student’s independence is highly valued and encouraged. The program also emphasizes developing musical ability and learning foreign languages. 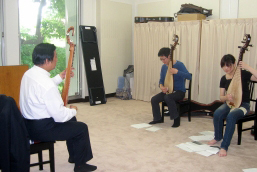 The department has established six specialty fields: (1) history of Western music; (2) history of Japanese music; (3) history of Asian music; (4) aesthetics of music; (5) theory of music; and (6) ethnomusicology. Instruction in these areas is based on lectures, seminars and tutorials. The most striking characteristic of this department is the large number of special topics it covers in a systematic manner, covering each subfield of musicology. Students who exhibit outstanding performance by the end of the second year can in certain cases arrange to graduate after the third year of the undergraduate program. First and second years: Students gain basic knowledge in each field of musicology and in research techniques, as well as the broad range of skills and training related to studies in musicology. Introductory lectures and beginning-level exercises in each of the six fields above are provided for musicology-major students, and lessons of musical performance are given. A core set of classes on foreign languages, general issues, and special basic topics are also required for all students. Third year: Students generally attend more specialized lectures and programs of study. They also begin one-on-one tutorials with an adviser and begin preparing to write their graduation thesis. A research trip is scheduled for the summer of the third year. Fourth year: Students study special topics of their own choosing and work to complete the graduation thesis. Students seeking to earn teaching certification take internships at high schools. Students in the master’s degree program pursue research in Studio 1 (aesthetics of music, contemporary music, ethnomusicology), Studio 2 (history of Western music), or Studio 3 (history of Japanese and Asian musics), with efforts culminating in a master’s thesis. Core requirements include two years of “seminar in musicology” and “special studies in musicology”, classes offered by their own studios. Students also can attend exercises and special research classes offered by studios other than their own. Certain undergraduate classes are also open to master’s degree candidates. While students in the doctoral program, like students enrolled in the master’s degree program, are assigned to one of the studios, instructors cooperate closely with each other beyond studio boundaries in order to address more advanced research topics. Depending on the topic chosen, they may also choose as advisors faculty from departments outside the Musicology Program or specialists from outside the university. To get credit for a special doctoral research program, first-year students make presentations in a general seminar and write first-year papers. In the second year, they are required to make a presentation in a doctoral colloquium and are strongly encouraged to present results of their studies at academic conferences and to submit papers for publication to academic journals. Meetings with advisors are held at least once annually in order to evaluate progress in independent research and to provide guidance for future research. Doctoral students are expected to gain the capacity and discernment to pursue research independently and to apply these skills in preparing the doctoral dissertation. Graduates of the Department of Musicology are active in a wide range of fields, including music education, journalism, art management and other areas of the music business, as well as working in private companies and government agencies. Some graduates are active composers and performers. Most graduates from the graduate school are scholars and faculty at universities and research institutions. Another outstanding characteristic of the Department of Musicology and the graduate musicology courses is their energetic pursuit of international students. In the 2009 academic year, these programs enrolled 13 international students from a total of 10 nations. There are many international students who excel in musical performance, and their studies exemplify the strong relationship of scholarly research and practice of music. International students from different countries enjoy a wealth of opportunities for international exchange through performances and other activities both on and off campus.